When a student first comes to you for guitar lessons, they don't know how good a teacher you will be. At the beginning the only thing they have to judge you and the quality of your lessons is the quality of the teaching materials you give them. Sometimes this is a conscious decision (when teaching adults) and other times this is a subconscious decision (when teaching kids). The main point is that almost all students will judge you based on the lesson materials you give them because at the start they won't have anything else to assess you on. So if you currently hand write all your guitar lesson plans, it's not going to rate well in your student's mind. They will see that as an indication of you being inexperienced even if you aren't. If on the other hand you use high quality materials, your student will have a good first impression and will be more likely to stay with you and believe you know your stuff. As explained above, your students will assess the type and quality of materials you give them. Different types of materials say different things. A guitar book bought from any music shop says to your student 'well this tutor is just like any other, they just buy the books off the shelf and teach out of it. I could teach myself with this book'. The reason our guitar lesson plans are so effective is because you have control over what materials you give your student. If you have a new student wanting to learn metal and the guitar book you give them starts off teaching them pop-rock songs - you've lost the game before you even started. It's very hard to win your student back after such a bad first impression. They want to learn metal and if you give them anything that won't help them achieve their goal of learning how to play metal, they will think you aren't a good teacher. On the other hand, if you had access to our range of guitar lesson plans, you could have simply downloaded and printed off relevant materials introducing the style and explaining what techniques they will need to cover. You won't have to cover metal straight away, but you can let your student know that you will be able to teach them exactly what they want and that you're the right person for the job. Using our lesson plans helps your student realize that you are the expert and that they need you. Teaching out of a book gives the wrong impression - it suggests to the student that they don't need you and that they could learn on their own. If you want to become a successful guitar teacher, using the right teaching materials is crucial. The most crucial reason is because we are guitar teachers and we understand what students need. We use all the materials you have access to in our own guitar lessons. That means we are constantly testing our materials to make sure they are effective. As soon as we feel that one of the plans isn't working properly, we will work out what is wrong and fix it. Makers of guitar books don't do this at all. They don't test the materials and even if they found some parts don't work, they can't change them. We are constantly testing our guitar lesson plans with our own students so you don't have to. In the below picture you can see an example of a typical lesson plan available. The page to the left is the learning material you give your student. 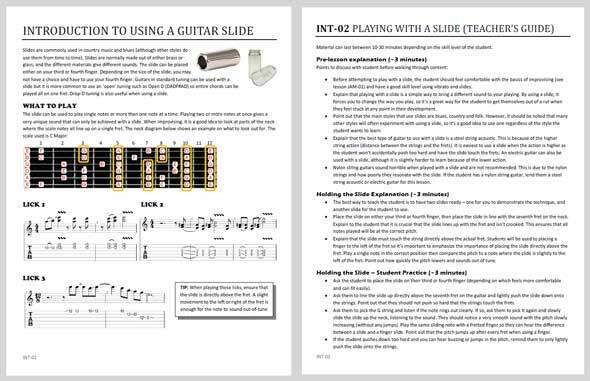 It covers everything they need to know about a certain topic (in this case, how to use a guitar slide). The page on the right is the 'teacher's guide' and gives you a complete breakdown how to teach the content effectively. The teacher's guide is everything you need to know - even if you aren't too familiar with the content. Whether you use the teacher's guide or not is up to you, the point is you have everything you need to teach the material effectively. Every lesson plan available in this site includes a teacher's guide to help you teach the content effectively regardless of your current level of understanding. We have guitar lesson plans for adults, guitar lesson plans for beginners as well as guitar lesson plans for kids (see the BBL series in our Lesson Materials range). As a member you have full access to a range of effective guitar lesson plans and worksheets that are always being constantly updated and improved. There aren't any guitar books that can continuously improve their lessons like we can. You have a team of guitar teachers working for you constantly writing new plans as well as updating and improving existing materials. Take advantage of the resources we have available right now by registering as a Live and Teach Guitar Member.